Chrichton's World: Review And Now You're Dead a.k.a. Enter the Eagles a.k.a. Hun shen shi dan (1998): Decent Hong Kong production starring Shannon Lee! Review And Now You're Dead a.k.a. Enter the Eagles a.k.a. Hun shen shi dan (1998): Decent Hong Kong production starring Shannon Lee! And Now You're Dead seems like it was an attempt to kickstart Shannon Lee as the action star to continue the legacy left by her father Bruce Lee and brother Brandon Lee. But as you might have guessed this didn't happen. In the first place because Shannon Lee herself didn't have the ambition too. Also by own admission because she wasn't nearly as talented and skilled as her father or brother. So how did she fare in this HK action flick? To be honest, she does seem to have enough skills to have made it had she pursued it. Unfortunately they didn't really allow Shannon to fight that much. And the few fights she is in are filmed up close so you can't see that well what she is doing exactly. But I bought it. She did steal every scene she was in with her attitude, looks and charisma. Acting wise she was fine in most scenes. Apart from one dramatic one where the dialogue is delivered very poorly. Only she can hardly be blamed for that since in my version it wasn't her voice. Whoever did the dubbing needs to be slapped. I don't know what it is but when English actors dub for Chinese or Hong Kong films they often give them accents that sound horrible. Just say the lines like you normally would. For some reason they had the brilliant idea to add Michael Wong, Jordan Chan and Anita Yuen into the mix. Wong is adequate but he easily could have been left out and it wouldn't have mattered much. Chan I suppose was intended as comic relief. I found him to be a little annoying. The best of the bunch is Anita Yuen who has real good chemistry with Shannon. The film should have been about these two. Instead it's all about Michael Wong trying to steal something for a ruthless client played by Benny Urquidez who also trained Shannon Lee. Read about that in this following article. Emerging from the Shadows of Bruce Lee, the Butterfly Spreads Her Wings. Then Jordan Chan and Anita Yuen get involved and things start to get real messy and chaotic. It's very obvious that they serve as padding since there is very little story to be told here. It doesn't really matter since it's the action that takes precedence. 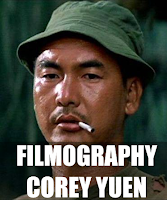 You can always rely on Corey Yuen to make it look good. He was signed on as director and like in most of his films he does his best to make it as exciting as possible. And he succeeded. The film also moves in quite a fast pace. You barely have time to wonder about the illogical actions of the characters. Especially the villains are relentless in the way they do business with their partners in crime. It's a shame Shannon Lee has no ambitions to pursue this career. She has the charisma, energy and star power that would have made me watch whatever film she would be featured in. She definitely outclasses actresses like Charlize Theron and Gal Gadot when it comes to fighting skills. Overall a surprisingly entertaining action flick as long as it lasts.